Today I’m going to show you a VERY effective list of employer branding strategies for your job descriptions. In fact, you’ll find 30+ strategies, tips and examples in this post. So if you’re looking to build powerful, converting job postings you’ll really enjoy this list. A lot of your candidates are coming from job boards like Indeed, Glassdoor and LinkedIn. This means they are bypassing your careers landing page and going straight to your job descriptions. Companies tend to focus the bulk of their employer branding efforts on their careers page. Little to no EB efforts are carried over to their job descriptions where the conversions are made. Why Is Employer Branding Important on Job Descriptions? Employer branding is important on job descriptions because they are the pages where your primary call-to-action is to “apply”. You want to give candidates as much info as possible to make the decision of whether to apply or not. Look at your job postings as a one-stop shop, where candidates don’t have to leave your pages in search of extra information. This one seems simple but often gets lost in the shuffle when integrating with an applicant tracking system. Ideally, you’d want company name and job title to make up the majority of your URL. You want your job pages to look the same as any other page on your website. This helps reinforce your brand to candidates. In the era of mobile traffic, responsive job pages are a must. It’s easy to spend most or all your employer branding time on the visuals (logos, color scheme, pics, video, etc.). But what about the countless words of text in your job postings? Gender bias — Make sure your language is gender-neutral. Check out Five Stats & Tips on Gender Diversity Recruiting and 5 Things to Look for in a Gender Neutral Writing Tool for some help. Check out 7 Tips on How to Write the Most “Readable” Job Descriptions for details on each. Better text = better employer brand. It’s important to include media on your job postings. Pictures and video boost engagement and time on page which are important metrics. Great media content above the fold on your job page sets the tone for your job descriptions and catches the candidates’ attention. There are a couple ways you can get this information into your job descriptions. It’s good to provide employer ratings and reviews on your job postings. Any click you can save the candidate and keep them on your pages is a win. Most employer ratings and reviews options are in the form of a widget. 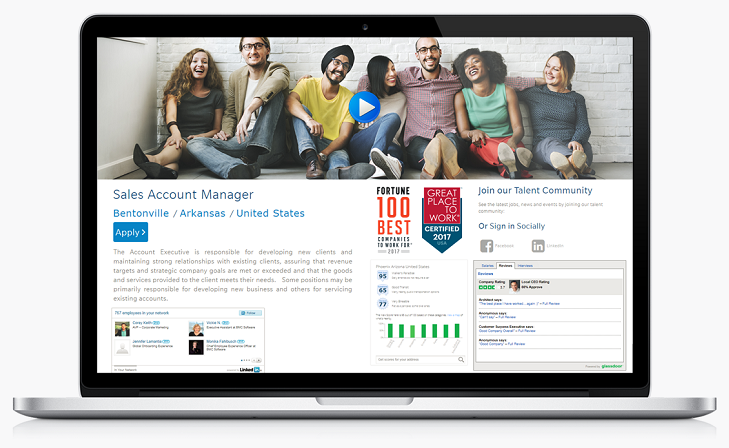 For example, here’s a Glassdoor widget that has features company rating, CEO rating, employee reviews and more. An alternative to Glassdoor is Comparably. Focused on company culture, diversity, gender and salary, Comparably is in the process of creating a recruiting widget for job postings. Another employer branding best practice for your job descriptions is including benefits details. They can provide that extra push to convert a job seeker into an apply. And also (you guessed it) saves the candidate extra clicks and research that would take them off of your pages. Here’s a list of 20 awesome employee benefits. Help candidates find out exactly where the job is located. Showing location pinpointed on a map adds more context than just listing city and state. Add a map and location data to make your job descriptions stand out. For more reasons and ways to implement commute time on your job postings CLICK HERE. If you’re looking to add social proof to your job postings, employee testimonials are a great way. We usually see them on company career pages, but they should also be on every one of your job ads. Here’s one way to get a testimonial on your job page (embedding a text box). Need help with ideas on how to embed employee testimonials on your job postings? This is a great article. Looking for more social proof? If you’ve got them, flaunt them. An employer of choice graphic can help close the candidate in the first few seconds of viewing a job description. The process of becoming an employer of choice and earning an award may seem daunting. But it’s usually a matter of registering, survey, and paying some money. Here’s a Comprehensive List of Employer of Choice Awards. Give candidates more than just a one and done experience. 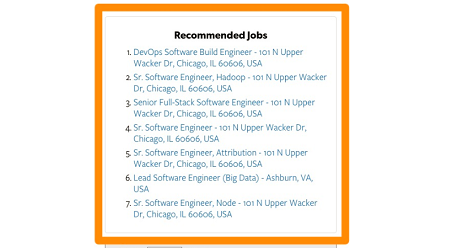 A recommended jobs recruiting widget presents jobs similar to the department, location and skills of the job page the candidate is currently on. Make sure your jobs are optimized for sharing to social media platforms like Facebook, Twitter and LinkedIn. These elements should automatically be grabbed by simply copy and pasting the job link into your post/status update. Here’s an example of a non-optimized social share job ad (left) vs. an optimized social share job ad (right). Walk Score is a location-based widget that provides detailed information on a specific location. Walk Score: Measures the walkability of any location. Transit Score: How well a location is served by public transit. Bike Score: How good an area is for biking. Content is a proven channel for lead generation and can be applied to recruiting. It’s a great way to provide valuable content to candidates and increase your chances of converting the apply. If candidates are interested in your company they want to learn more and a career blog is a perfect way. Some recommended topics include early career advice, day in the life, employee spotlights and the recruitment process. Just having these types of links available lend more credibility and transparency to your job postings. Tenable is an example of a great career blog. Here are 5 Tips for Creating a Company Career Blog That Recruits For You. Your EVP shouldn’t just be on your company career page. Like many of the other items we touched on, they should be on every one of your job descriptions. Why should the candidate work for your company rather than another? Why is your company a great place to work at? What can you offer candidates that other companies can’t? Diversity and Inclusion are most likely at the top of your HR priorities. That means including a diversity statement on your job descriptions is a must. I’m not talking about an EEOC filled with legal jargon. I’m talking about a compelling statement from the heart of your company. Here are 10 Examples of Awesome Diversity Statements and what makes them awesome. Job descriptions are an integral part of your recruiting process. Ongig provides job page overlays that integrate with your applicant tracking system. Job page overlays allow you to take back control of your job pages.